Those who know me, know I love decks that are complex and have lots of interactions. I love a deck that rewards tight play and a solid grasp of its play lines. In the days or yore, I played a casual Enchantress deck with Bramble Elemental and Aura’s like Rancor, Mark of Fury, Crown of Flame, Fiery Mantle, and Ghitu Firebreathing. 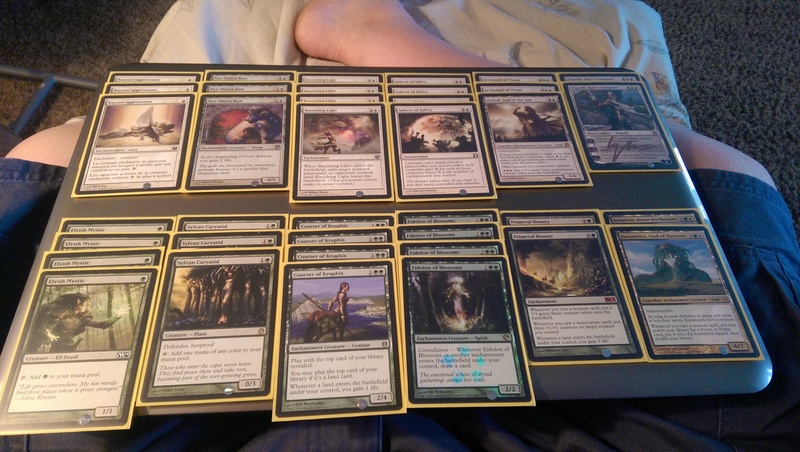 When I saw that GW Enchantress was a thing in Legacy I immediately wanted to play it. Granted, it’s not a very popular archetype and the argument against playing the deck is very reasonable. It is, for the most part, a bunch of separate pieces that do nothing alone and eventually coalesce into a win-condition–some would argue too slowly. In other words, Enchantress is a Control deck with a combo finish and in a format where combo also includes Show and Tell, Hypergenesis, and ANT, a turn nine or ten win just isn’t as impressive. However, what about in standard? I was skeptical at first when I saw our enchantment Enchantress was 4CMC, but in a world with Aburpt Decay 2GG is actually better than 1GG and besides, the three-drop slot is packed full of other wonderful toys. Cards like Courser, Boon Satyr and Banishing Light, cards that make the deck not just a collection of enchantments that do almost nothing but instead of collection of creatures that can beat down. The list I’m playing right now was inspired by the one Tomohoro Saito posted right when Nyx released. I’ve since changed the list after a week of general success and then a week of nothing but draws as game one took forever. The core of the deck’s power is Sphere of Safety. Since just about all of your creatures are also enchantments, sphere stacks up rather quickly and most decks can’t even get through an enchantment count of three or four. It’s not like the deck fails to operate without it either. 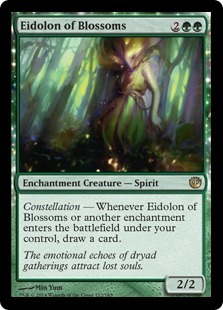 The Caryatids, Rams, and Coursers are massive brick walls for most decks that allow you to get past turns five and six when Elspeth, Karametra, and Thune take over the game. Rays and Light make for an effective removal package, placing a further tax on their earlier threats trying to attack and removing big threats somewhat permanently. I’ve so far had pretty solid matches against Aggro and most Mid-range decks, but devotion Decks–especially those playing Nykthos–can push through a single Sphere without too much trouble. Gray Merchant and Fanatic of Mogis are both very dangerous cards, since you really only have four spells that remove a permanent from the field. I had the Thunes side, but I feel like I need to be able to win/steal Game One so that I’m under less pressure to close out two more games and with the Rams, Coursers, and Primeval Bounty, I do gain a lot of life and my creatures get massive quickly. I’ll have a report from states after this weekend, but until then, if you have any questions leave me a comment or tweet me @darkr3x. Until next time, my all your top decks be excellent. Zachary Jernigan's Science Fiction & Fantasy Blog! Want to know the next time the muse strikes? Want to know next time the muse strikes?